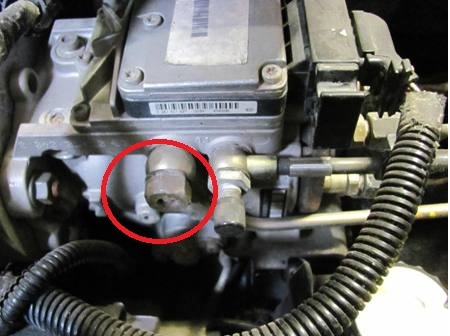 If you are starting your Cummins for the first time, it is helpful to “bleed” the air out of the injector lines by loosening the injector line nut just enough to allow fuel and air to escape the line while you are cranking the engine. It is usually required to do at least 3 injector lines. Tightening the line nut while you are still cranking the engine is the best way. This is also a good way to verify that the injector pump’s shut down solenoid is allowing fuel to the injector. If your supply fuel line is loose, it is possible to draw air into the fuel system at that point, so if you suspect you are not getting rid of the air in the system check your supply line connections. These engines should have between 7-15 psi of lift pump fuel pressure (higher pressures can cause serious damage to the injector pump). We have banjo bolts available that allow you to connect a gauge to your fuel system, if your supply banjo bolt at the pump does not have a schrader valve on it already. If you have fuel at the injectors, your wiring is good. If you also have good fuel supply pressure, and you are fairly certain you have no more air in the system, you may have a weak injector pump. 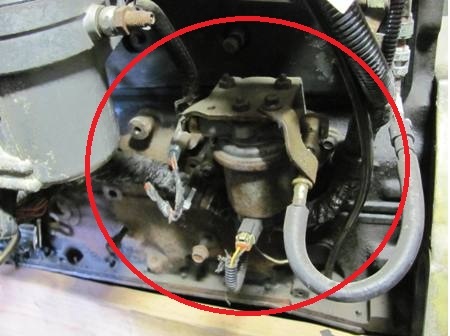 It is fairly common for these injector pumps to have a problem like this. You may especially suspect this kind of problem if you have never heard the engine run before, or if you had to replace a faulty lift pump. If you have no fuel at the injector, but you have good fuel pressure, then either your injector pump relay is not wired correctly or you don’t have key on or constant power to your ECM. Sometimes a faulty cam or crank sensor will prevent a start as well. If you have poor supply pressure and it's not the lift pump (shown below), check your overflow valve (pictured below). If you take the overflow valve out and it rattles, the regulator spring is broken. Other causes are cracked or otherwise leaking hoses (letting air in, instead of sucking fuel) between the lift pump and the tank, or a bad restriction.